Brainwave Entrainment is defined as any practice that aims to cause brainwave frequencies to fall into step with a periodic stimulus having a frequency corresponding to the intended brain-state It relies on the "frequency following" response which is the human brain’s tendency to change it's EEG frequency towards the frequency of an external stimulus. Audio Visual Entrainment uses flashing lights and pulsing tone to guide the brain into various states of brainwave activity The oldest form of this technology is fire and native drumming. Since ancient times, we have known that flickering fire and rhythmic drumming is a tool for introspection and provides insight on the journey of life. Mindfulness Machines recreate the effect of flames in the form of flashing light in precise patterns and the frequency of pulsating drum rhythms that can help you access dimensions and retrieve information deep within. Using this technology helps you gain the ability to access the four directions of physical, internal, mental, and emotional awareness. The mindfulness machines used by Brain Wave Fitness incorporate the benefits of binaural beats with a similar technology that presents flashing lights to the eyes. With special GanzFrame glasses over your closed eyes and headphones over your ears, you are immersed in colorful geometric jewel like patterns and entrancing sounds. A few things that one could compare it to would be the awe of blazing fireworks covering the night sky, the entrancing wavering of reflections on a garden pond, clouds of flickering fireflies or the deluge of imagery that engulfs the consciousness at the borderland of sleep. Even the most experienced meditators find that it breathes new life into their practice. 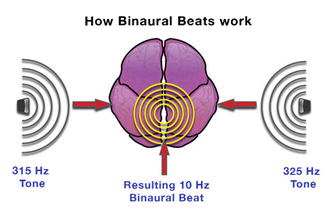 Binaural beats are a technology where two differing frequencies are presented to each ear, and the brain perceives a third frequency which is the sum of the two frequencies presented. This new frequency is ‘latched onto’ by the brain, resulting in the desired state. For example, if we send the left ear a tone of 150hz and the right ear a tone of 157hz, the brain will interpret a binaural beat frequency of 7hz, which correlates to the Theta/Relaxed brain state. There are several studies supporting the efficacy of using binaural beats for brainwave entrainment. The light sound machines utilize this technology to achieve brainwave entrainment. Foster, Dale S. EEG and subjective correlates of alpha frequency binaural beats stimulation combined with alpha biofeedback. Diss. Memphis State University, 1990. Oster, Gerald. "Auditory beats in the brain." Scientific American 229.4 (1973): 94-102. Kuwada, Shigeyuki, T. C. Yin, and Robert E. Wickesberg. "Response of cat inferior colliculus neurons to binaural beat stimuli: possible mechanisms for sound localization." Science (New York, NY) 206.4418 (1979): 586. ATWATER, F. HOLMES. "BINAURAL BEATS AND THE REGULATION OF AROUSAL LEVELS." Atwater, F. Holmes. "Accessing anomalous states of consciousness with a binaural beat technology." Journal of scientific exploration 11.3 (1997): 263-274. Owens, James D., E. Kasian Justine, and Gail R. Marsh. "Binaural auditory beats affect vigilance performance and mood." Physiology & behavior 63.2 (1998): 249-252. Wahbeh, Helané, et al. "Binaural beat technology in humans: a pilot study to assess neuropsychologic, physiologic, and electroencephalographic effects." The Journal of Alternative and Complementary Medicine 13.2 (2007): 199-206. Huang, Tina L., and Christine Charyton. "A comprehensive review of the psychological effects of brainwave entrainment." Altern Ther Health Med 14.5 (2008): 38-50. Kennerly, Richard Cauley. An empirical investigation into the effect of beta frequency binaural beat audio signals on four measures of human memory. MS thesis. West Georgia College, 1994. Harris, Bill. "The Science Behind Holosync® and Other Neurotechnologies. "Centerpointe Research Institute 6 (2003). Atwater, F. HOLMES. "Inducing altered states of consciousness with binaural beat technology." Proceedings of the English International Symposium on New Science. 1997. Kasprzak, C. "Influence of binaural beats on EEG signal." ACTA PHYSICA POLONICA A 119 (2011): 986-990.